Doc's Gold Screamer Amplified Power Pack. Lithium Ion Battery Solution Speaker pictured is an optional accessory, not included. See further description on How to order this speaker below. NOW with Super Battery Charger with Digital Charge readout. 110 / 220 VAC / 12 VDC. Both AC Main and 12 volt charger. Australia Customers request a free Diagonal Plug adapter to use unit on. Lose the cord, lose the weight, Pump. Up the Volume and Set Yourself FREE. The Lite Weight (14 ounces) Power Solution. With AMPLIFICATION, no long power cord. For your SD2000, SD2100, SD2200. GP Extreme, GP 3000, GP 3500. 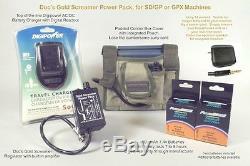 Doc's System is less expensive than the heavy batteries supplied with your Minelab Detector. (2) NOT One but TWO! 7.4 volt Batteries, 7 to 8 hours run time each. Integrated power cord, lose the long power cord that gets caught on bushes. Built in Amplifier, strong enough to drive speakers and headphones at the same time 4 times amplification, hear those faint targets. Regulator, adjusts 7.4 volt battery down to a constant 6.7 volts for SD and GP machines, provides required 8 plus volts for GPX machines. 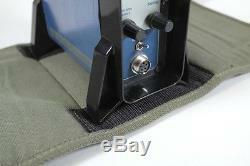 Padded Canvas Control Box Cover with built in Pouch to machine mount your system. Speaker pictured is a DELUXE speaker and not included. The item "Gold Screamer Power Pack Minelab Metal Detector GPX5000, GPX4500, GPX4000 SD2200" is in sale since Sunday, June 05, 2016. This item is in the category "Consumer Electronics\Gadgets & Other Electronics\Metal Detector Accessories". The seller is "cop704" and is located in Las Vegas, Nevada.